Nokia has launched a new mobile handset as,”Nokia 206″ in the domestic market under ultra basic phone category. Nokia, one of the leading giant in telecommunication industry and offered a wide range of products starting from mobiles phone to Smartphones and Mobile computers, it also serves in Networks. Earlier, in the month of November Nokia has announced to introduced Nokia 206 at Indian shores in couple of months and finally it showed up at Flipkart. Nokia 206 featured with 2.4-inch screen display with 240 x 320 pixels resolutions. It also come with a descent 65k color display. 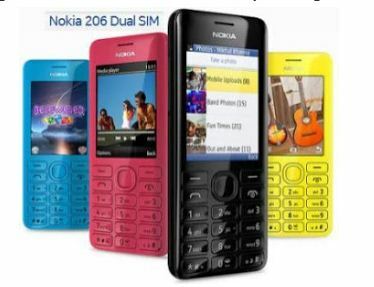 Briefing it’s Platform dependency, Nokia 206 operates on S40 Operating System series and equipped with Dual SIM (GSM + GSM) with Dual Standby technology. In terms of Body weight, this device spotted with 12.4mm of thickness and weighs around 91 gms. To make the use more easy this device dubbed 5-way scrolling keys, the most SLAM feature in this phone is it enables multimedia content sharing between phones equipped with Bluetooth, regardless of the OS (iOS and Windows Phone not supported currently). Nokia 206 will also come up preloaded with software features including eBuddy instant messaging apps with screen notifications, free Nokia Life+ web app, including the Life Skills and Live Healthy services, a comprehensive mobile entertainment package including 40 free EA Games available for download from Nokia Store, Xpress Browser, Nokia Nearby, it is also offered with a dedicated SIM manager that allows users to switch SIM cards without switching off the device. In terms of Photography, Nokia 206 supports 1.3 MEGAPIXEL of rear Camera with VGA video recording, 3.5mm audio jack, Stereo FM Radio with RDS. Dealing with Storage Specifications, this device equipped with a microSD card slot (memory can be easily extended upto upto 32 GB). 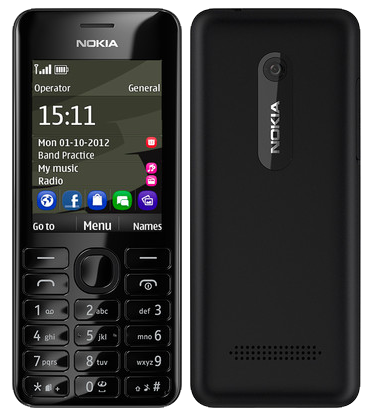 In terms of Connectivity, Nokia 206 supports 2G GPRS/EDGE, Bluetooth 2.1 + EDR. To power it up, Nokia 206 equipped with 1110 mAh of battery which claims to deliver up to 20h talk time and up to 680h standby time. Nokia 206 falls under a price tag of Rs 3599. And it available on Flipkart.